Well, I had to have a recipe for you this holiday season that reminded me of my Italian father. He was an excellent cook and acquired his skills from his mother and grandmother. So any time I cook an Italian recipe, it reminds me of him. 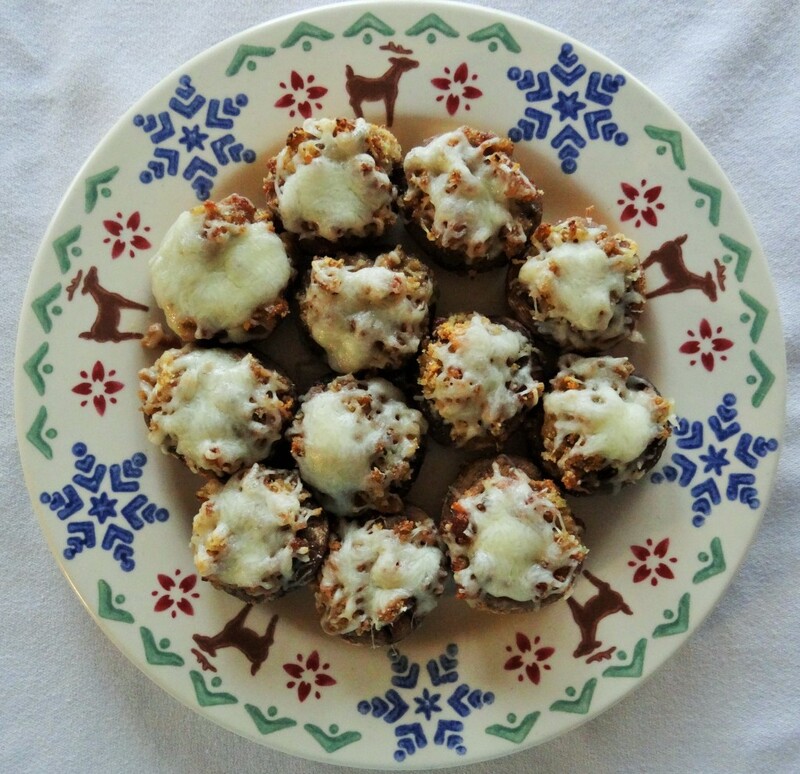 Italian Stuffed Mushrooms are one of the appetizers I love to make at the holidays. Whether it is for a party, before a special meal or for our traditional Christmas Eve Appetizer buffet, this dish finds its way to a spot on the table. My husband also loves mushrooms, so he is happy that it is always on the menu. There are lots of recipes out there for stuffed mushrooms, but I particularly like the ones with an Italian flair. You can make the stuffing for these several days ahead of time, and assemble them when you are ready. Always a plus when you are super busy. So, in honor of all my Italian relatives, on the Tenth Day of Appetizers, Dianna is bringing to you…Italian Stuffed Mushrooms! Remove stems from mushrooms. Finely chop the stems and set aside. Clean mushrooms with a paper towel or vegetable brush. Place olive oil in a frying pan on medium heat. Add sausage. Break apart and cook for 5 minutes. Add onions and chopped mushroom stems. Cook another 5 minutes until meat is browned. Add garlic and cook for one minute. In a bowl, combine bread crumbs, parmesan cheese, ⅓ cup of mozzarella, and seasonings. Pour in meat mixture and combine thoroughly. Drizzle with melted butter and combine. Place mushroom caps in a baking dish. With a small stainless steal scoop, fill mushrooms with filling. Bake for 12 minutes. Top with remaining mozzarella cheese. Bake for an additional 3-5 minutes until cheese is melted. Serve warm.